San Francisco’s Little Italy might not have the notoriety of New York’s. Within the city, it takes a backseat to SF’s more famous Chinatown. But newcomer Il Casaro is one example that proves it is worthy of the neighborhood monicker. It has added more youthful vibrance to a neighborhood steeped both in tradition and the trappings of tourism, which include several strip clubs. When it opened in March 2014, Il Casaro attracted attention from the food media, including from industry powerhouse Eater. Public relations aside, Stopping in for a bite at this small but open, bright pizzeria, the true to form flavors and crisp, cosmopolitan ambiance will bring joy to your palate. The open dining room features a marble bar surrounding the visible oven and work area. This layout is perfect for watching the delicate clockwork with which the 3-4 cooks prepare everything from spiedini di calimari (skewers of calimari and zucchini roasted in the pizza oven) to bruschetta to fresh pastas to their signature Neapolitan pizzas. Il Casaro serves Italian beer and an all-Italian wine list. On a hot day, the light rose I chose was perfection with both my salad and pizza. 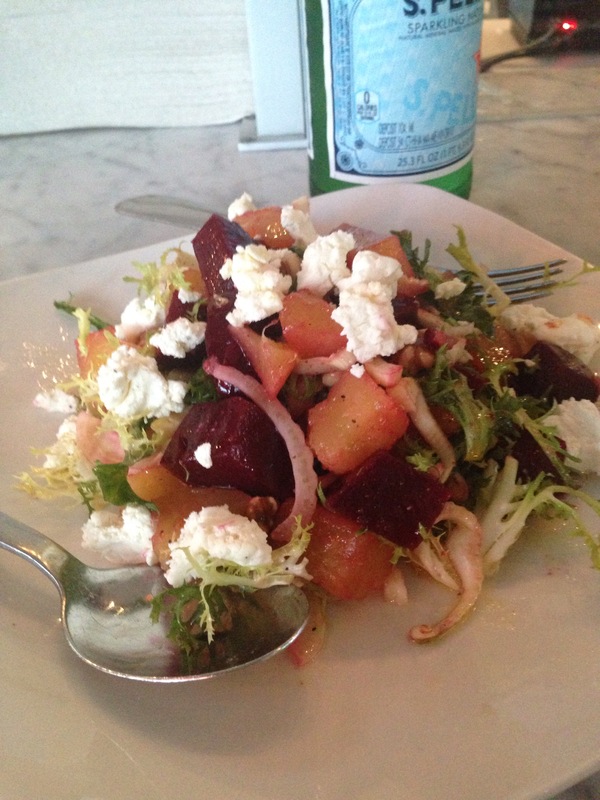 Needing a dose of vegetables, I chose the beets salad [sic] for a starter. This eye-catching salad pairs golden beets and goat cheese (the PB&J combination of the ’00s, but it still more than works) among spiky frisée and walnuts, all simply dressed in lemon juice and olive oil. It’s a synchronous combination that highlights the freshness and compatibility of each component of the dish. In my own case, I hit a stroke of good luck: My server informed me that the typical golden beets were supplemented by the fortunate purchase that morning of fresh purple beets. What a lovely, delicate plate. Il Casaro’s menu is indicative of only small deviation from the purist’s Neapolitan pizza-making techniques. (I haven’t seen indication that any of their pizzas meet the strict standards for D.O.C certification). A fan of pizzas that skew vegetarian, I picked the Nonna (pictured in the featured image) for its eggplant and two cheeses. 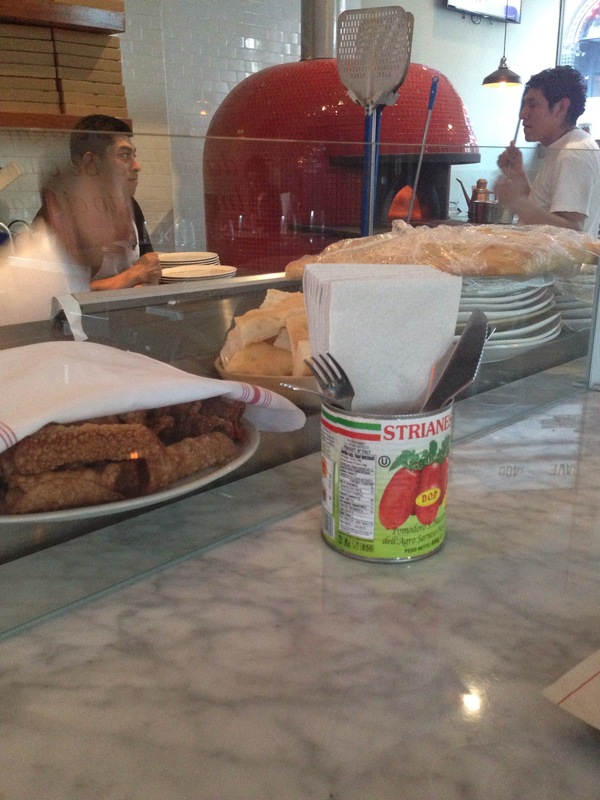 Its thin crust is layered first with a base of simple, but naturally sweet and tangy San Marzano tomato sauce. Salty, soft ricotta salata and fresh mozzarella offset lightly fried eggplant, the latter of which is kissed by a nutty extra virgin olive oil. Not a touch of excess grease remained, which made me very happy. Further, no single ingredient or flavor overpowered the others – a sign of a well-constructed pizza. The crust was nicely charred but not burnt, and the edges were nicely soft and chewy. Il Casaro was a solo dining experience I more than enjoyed. For simple Neapolitan flavors in their natural habitat, and modern ambience, I’m hard-pressed to find anything for the restaurant to improve upon. I certainly will return.